With a precise understanding of the relevant industry, we introduce ourselves as the leading merchantile exporter, wholesaler and supplier of Nail Punches. Finding use as hand tool for carpenters, offered punches are manufactured using advanced technology and superior quality components in compliance with industry standards. Steel - Carbon Steel Body. With sincerity and hard work of our experts, we have carved a niche for ourselves in this domain by offering Wire Nail Header Punch. - Made of Tool Steel, Hardened and Tempered. Heavy Knurled Body for better grip. Shiny Black Finish. Handy Tool for Carpenters, Model Makers, Machinists etc. Available in individual sizes and also in a set of Five in attractive Plastic Pouch. 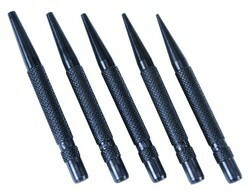 Manufactured From Selected Carbon Steel, These have a Knurled round Shank that provided a positive, nonslip grip. These are designed for driving nails heads below the surface of wood.Size:- 1/8", 5/32", 3/16", 1/4", 5/16", 3/8"Available in :- 4" & 6" Lengths.Also Available with Squares Strinking end..
We are offering Nail Header Punch. Overall length: 100mm (4 inch ). Max: points : 52 - 58 HRC). 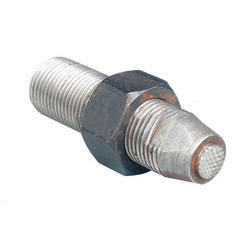 Ever since we entered this industry, we backed with a nimble work force present a best grade of Nail Punch.